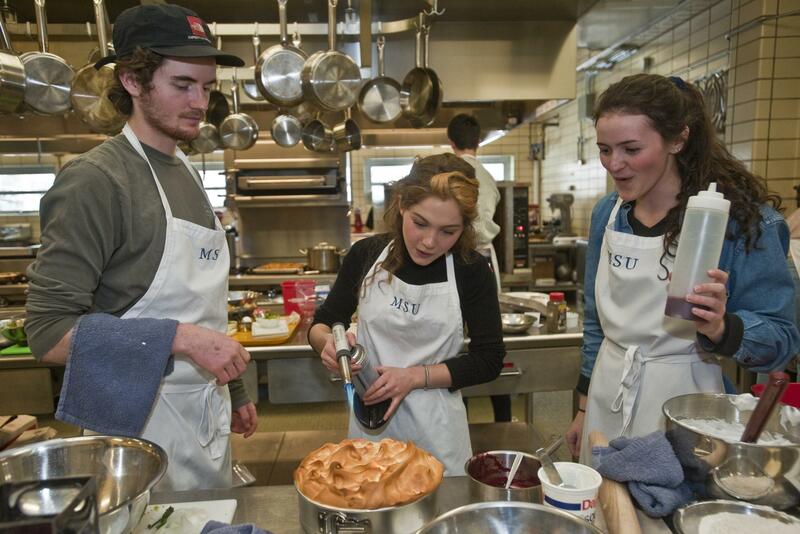 Winners of the 2nd Annual Bug Cook Off Competition at Montana State University Bozeman: Kael Van Buskirk, Laurel Aytes and Rochelle Maderal put the finishing touches on their Key Lime Meringue Pie with Blackberry Black Ant Reduction. On the week of Valentine’s Day this year, Montana State University Bozeman hosted the 31st Bug Buffet. I will admit to being repelled by the whole idea of insects initially. When Chef Marcy Gaston, Assistant Teaching Professor in the Hospitality Management and Culinary Arts program, invited me to judge the 2nd Annual Bug Cook Off Competition, I was uncertain as to whether I wanted to sample the culinary creations made by mostly novice cooks, and then sample food that intentionally included creepy crawly insects. I have eaten bugs before. A friend gave me a package of barbecue crickets as a joke. I liked the crunchy smoky flavored treat reminding me of biting into the crispy fried bones of a flounder or rock fish that I savored as a child. Then in Thailand, many years ago, I remember eating a heavily salted cricket, but I never purposely sought out insects to eat after that. Though I am sure I ingested many without my knowledge. Associate Professor, Dr. Florence Dunkel, founder of the Bug Buffet in its 31st year and the 2nd Annual Bug Cook Off posing next to a Tuna Ant Salad Sandwich and Bug Sushi and Ginger Cupcakes. A dozen years ago, my friend Marilyn Bland gave me a metal box with a sculpted cricket designed as the handle for the lid. Inside a recipe for cricket tacos provided instructions to roast crickets tossed with minced garlic, lemon juice and salt in a 350 degrees F. oven for 10 minutes. I never made the effort to secure the insects to fulfil this recipe. Perhaps, I will now. At around 10:30 on this Saturday morning, I entered through the back of Hannon Hall into the teaching kitchen, to be greeted by Chef Gaston. Already there were several students in this industrial sized kitchen. Some were looking at seasonings and spices set out on a side table while others were setting up cutting boards and gathering equipment. One person stood by the stove making an omelet while a group of three people huddled over a recipe. Sunlight beamed into the space from high side windows. From now to 1 o’clock, the kitchen was open to competitors to set up and secure what they needed for cooking their recipes. They were welcomed to settle in and get their bearings. Basic pantry items were supplied with special requests taken and fulfilled earlier in the morning for needed ingredients. Dr. Florence Dunkel, Associate Professor in the Department of Entomology at MSU Bozeman started the Bug Buffet 31 years ago. The first dishes included common grasshoppers sautéed in butter. Then as time went on, offerings such as brownies, southern fritters, tacos and quesadillas whet the appetites of those wanting to taste food made with insects. She encouraged her teaching assistants to highlight the specialties they were familiar with. 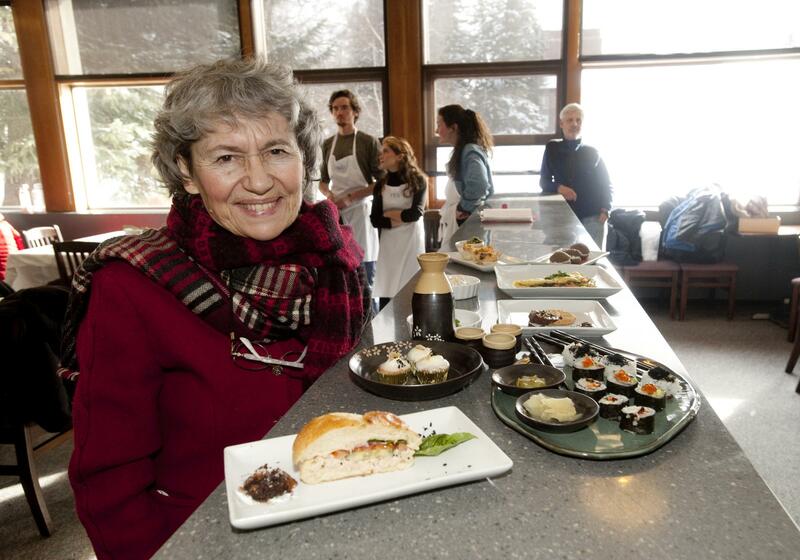 Then in 2012, after receiving recognition for teaching excellence, she took the award money to pay the MSU culinary services to prepare the meal. Dunkel was thrilled to show up for the event with food already prepared and beautifully presented. However, she fondly remembered the days she and her teaching assistants spent hours preparing for the feast. 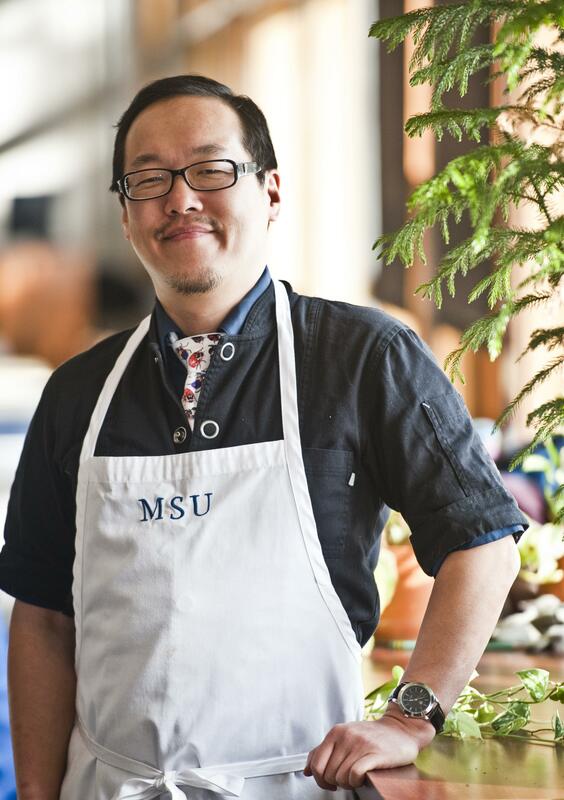 Chef Joseph Yoon of Brooklyn Bugs. Four years ago, Dunkel expanded the Bug Buffet to include insect experts from around the United States and Canada. Patrick Crowley, founder of Chapul, the first company in the United States to launch an insect product and developed the first cricket flour on the market, was invited by the College of Business as the entrepreneur resident for the week. Dunkel recruited him as the first speaker. 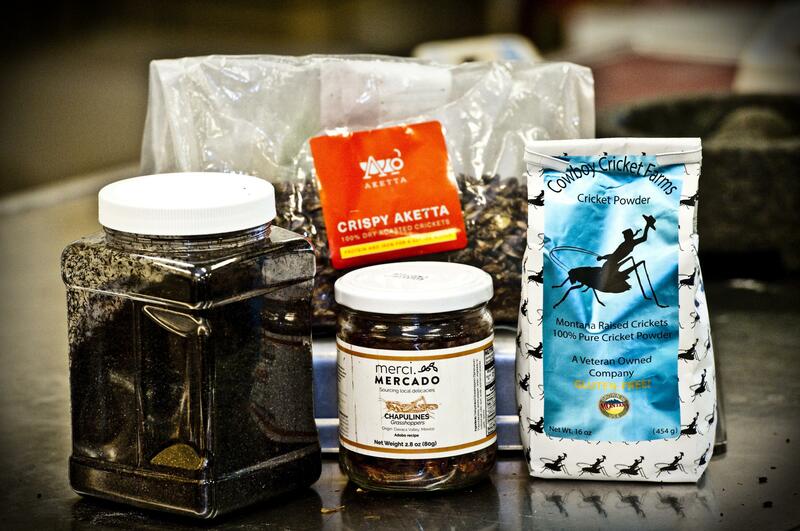 This year, the bug filled week launched with the Bug Cook Off Competition included workshops by Chef Joseph Yoon, the Brooklyn Bugs Chef, and Julie J. Lesnik, PhD, author of Edible Insects and Human Evolution with off campus tours at Cowboy Cricket Farms in Belgrade. For the buffet, attendance reached close to 1000 last year and now takes place in the ballroom of the Student Union Building. She shared of her favorite story of the Ute Native Americans who lived around the great Salt Lake. When the pioneers arrived and lost their first crop to drought. The Native people gifted prairie cakes made of service berries, game and the Mormon Cricket or shield-backed katydid, the very insect that destroyed the harvest. Dunkel’s journey into eating insects began when she, as a post doc in Minnesota, taught a pond study class where she said she ate everything that grew around the pond. Then in Rwanda, after buying bag of locusts from a boy and then taking them back to her hotel to have the chef prepare them, her fondness for eating insects continued. The preparation of the locusts by the chef reminded her of eating soft shell crabs. For the 2nd Annual Bug Cook Off, crickets, black ants and grasshoppers were the ingredients making each dish more bugalicious. In participating with a friend on an art project, his want of incorporating insects into his cooking began. Yoon started hosting popup dinners and now is a bug ambassador striving to introduce edible insects as a sustainable source of protein that can be found in the pantry, eaten as a snack and beautifully plated by chefs. 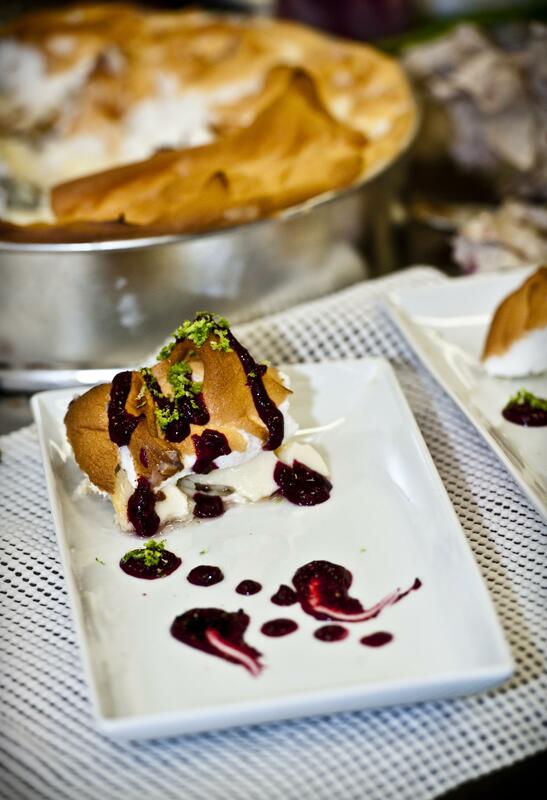 Key Lime Meringue Pie with Blackberry Black Ant Reduction was first place winner’s Laurel Aytes’ mother’s recipe. With nine teams composed of an average of two people, calm mostly prevailed in the kitchen. I had expected more anxiety, preconceived from watching too many reality cooking shows. But there was no drama but a light-heartedness and confidence to this day’s participants. The competition took off with cheers and hoots of enthusiasm as cooks attempted to incorporate ants, crickets or grasshoppers into their dishes. “Black ants have a citrusy flavor. Crickets are a little more nutty. Grasshoppers, the only way we could describe grasshoppers was they taste like grasshoppers,” Chef Gaston described the insects. “I am making a black ant and mushroom risotto so I’m vey excited about this. It is out of my comfort zone, but I am excited to find out how it goes, hopefully good,” Lauren Seuell said. As the students were putting the finishing touches on their dishes, the fire alarm went off. At first, everyone ignored the warning, but soon we found ourselves standing outside in the cold. When all returned to the kitchen, competitors were given another half hour. Chef Joseph Yoon, Lynn Donaldson and I were given seats around a table in the front of Hannon Hall’s dining room to judge. The teams after drawing numbers presented their dishes to us one at a time. Our judging criteria consisted of “Creative use of the insects, Presentation, Overall flavor of the dishes and Execution of the meal” totaling 30 points. From tasting street tacos with ants to omelets with green peppers, ham and crickets to cricket dumplings to minty chocolate whoppie pies with black ant and mint to tuna ant salad sandwiches, we decided on a winner. Laurel Aytes with her teammates Rochelle Maderal and Kael Van Buskirk took first place with their entrée of Cricket Potato Latkes with Applesauce and Turmeric Aioli and dessert of Key Lime Meringue Pie with Blackberry Ant Reduction. The recipes from Lauren’s mother showed artistically on the plate and showcased good cooking even though Lauren admitted to never having made the dessert before. This experience of judging the 2nd Annual Bug Cook Off infected my want to incorporate insects into my cooking. I was impressed with the calm and confidence the students showed in their cooking and frankly, the food was bugalicous. I was glad that Chef Marcy Gaston and Lynn Donaldson bugged me to participate. As Dr. Florence Dunkel would say, “Bug Appétit” and indeed, my savor for bugs has become “Bon Appétit”. The house of perpetual spring is found year-round between Billings and Laurel, Montana, not far from the Yellowstone River. In a 30,000 square-foot aquaponic greenhouse, Swanky Roots grows lettuce, herbs, edible flowers and microgreens. The owners, mother and daughter team Ronna Klamert and Veronnaka Evenson, started their venture in 2016. Flavors: Food Traditions or Nontraditions? Just before the calendar page flips into the New Year, some of us have traditions or rituals we put into practice to honor the start of another year. In the few years Flavors Under the Big Sky: Celebrating the Bounty of the Region has been on the air, I have gone near and far in Montana to talk to chefs, cooks, producers, restauranteurs, farmers, ranchers, wine makers, brewers, designers and many others who nourish us. I know I have countless more people to talk to who make our Big Sky foodscape more delicious. I look forward to meeting and talking to you. The corner of 3rd Avenue North and North 19th Street in Billings warms with spice and flavor. On the outskirts of downtown, Mirch Masala, an Indian restaurant opened by the Patels in the fall, serves up homestyle vegetarian food. With mother and chef Vandana, patriarch Navnit, son Nick and his wife Delisha with grandson, Neel, and daughter Dhara and husband Vatsal, they illustrate what can be cooked up with the power and energy of family.